I grew up in the 70’s, an era known for its kitch and bad taste. 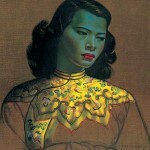 My grandmother was an ardent admirer of the painter Vladimir Tretchikoff. Several prints hung in her lounge (the Lost Orchid, Pink Lotus and others) but what most intrigued me was a picture book that she had of his work. This book was an A3 size with full colour photo’s of his most popular paintings, including the ones that he did during his stint in the Orient. 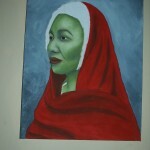 A particular favourite of mine was the Green Lady – probably his most well-known piece. 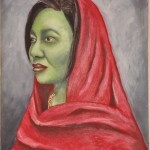 I found the colours of her skin (green and blue with a touch of red) absolutely fascinating and would stare at the picture for hours. My grandmother passed away in 2003 and the prints and the book were donated to the old age home where she spent her last years. I forgot about it until a couple of years ago at a bookclub meeting with my friends. A friend of mine, Cristelle, was into making jewellery and brought some pieces to show us. One of them was a laminated picture of the same Green Lady on a scrabble tile. I was immediately drawn to it because of the memory of my grandmother but when I turned the tile over and saw that the letter on the back was “L” (the first letter of my name), the deal was clinched! I bought the piece and it has since become a favourite of mine. 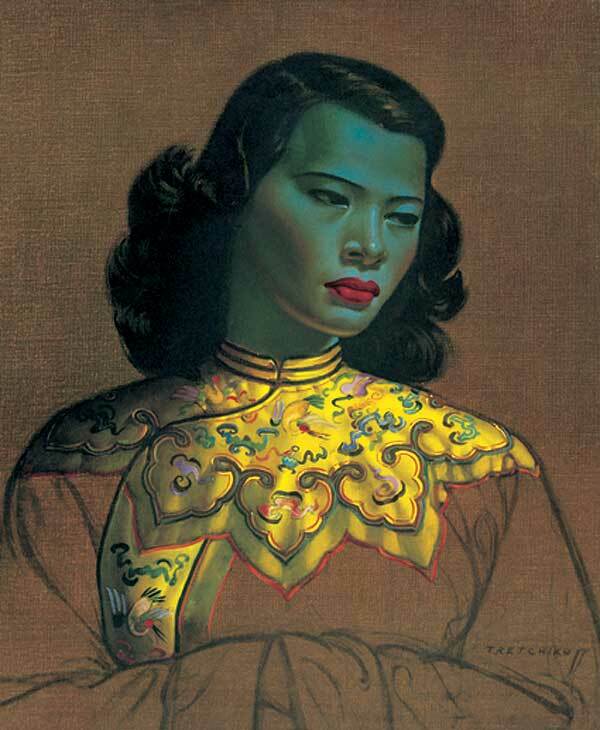 A year or so later I bought a book on the art of Tretchikoff and the full colour photo’s of the green Asian ladies so inspired me that I had to try it out. But where to find a model? The opportunity presented itself not long after. During a training course at work, I spotted a colleague whom I had known for a couple of years and thought she would make the ideal model. She had the most interesting face with beautiful traces of Asian influences. An artist cannot be timid, so I boldly asked her if she would mind posing for the photos. 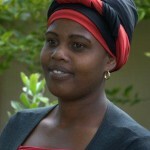 She generously agreed and became the model that I worked from. 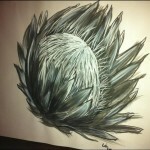 First I did a layer using Sap Green, Titanium White and Payne’s Gray. The latter was used for the shadows because it’s a beautiful dark blue without being too bright. I didn’t use yellow on the face, preferring white. 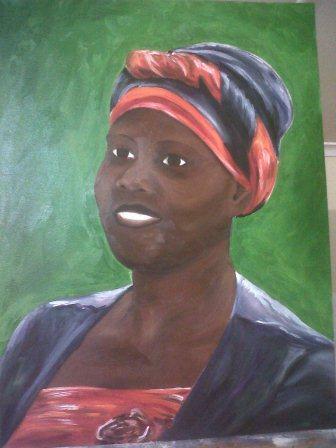 At first I wanted to do the face in an impasto style which I did over the first layer. 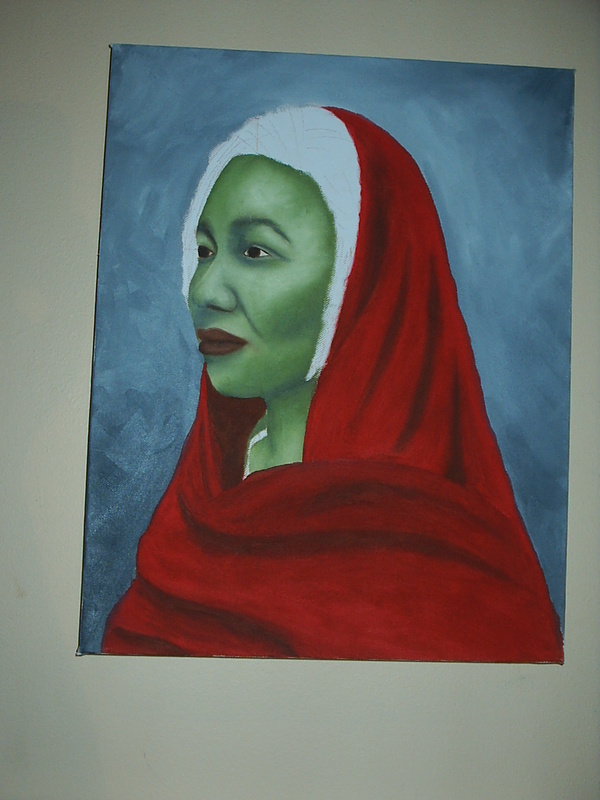 The veil was done in red, burnt sienna for the shadows and red mixed with white for the highlights. 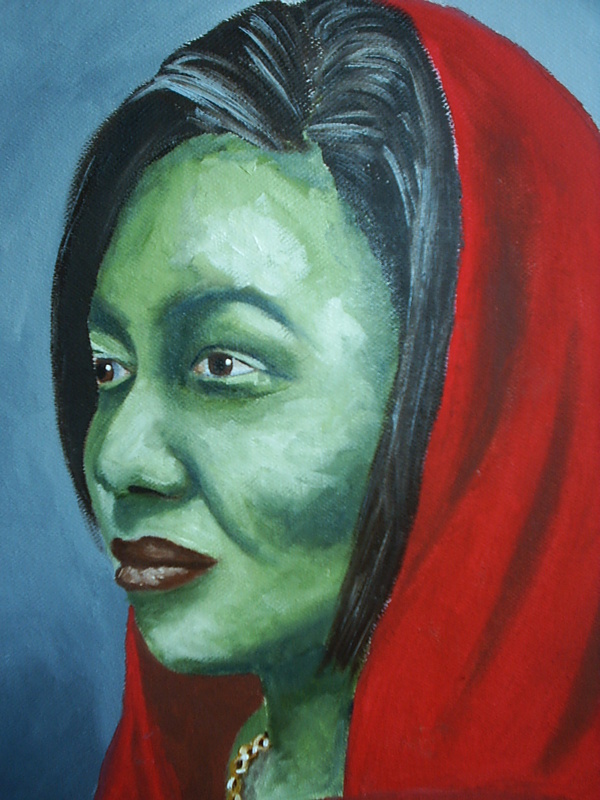 When I showed the painting to a friend, she commented that the skin was a bit too rough – it looked like the lady had bad skin… Fortunately the paint was still fairly wet from the previous day and I could blend the skin quite easily. I must admit that it looked a lot better after that. I’m quite pleased with the final product. 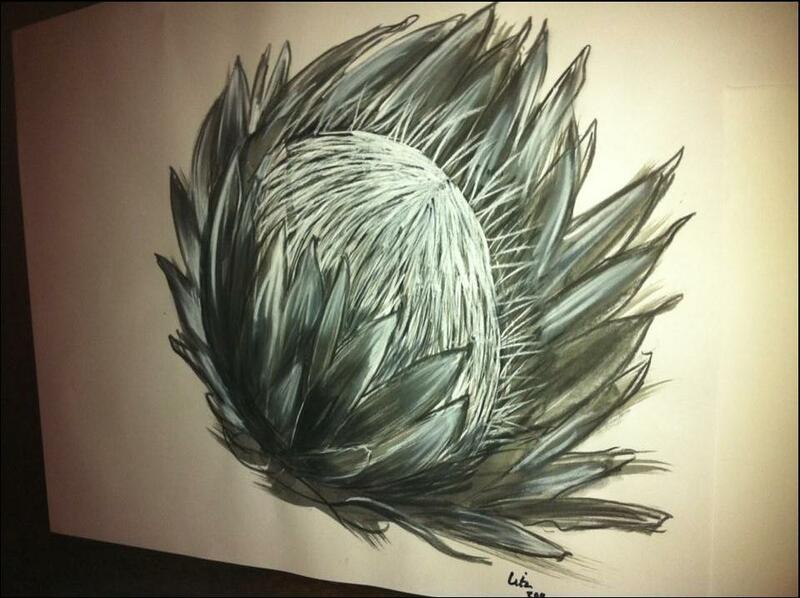 The background was done in Ivory Black and white and I made it darker towards the bottom. 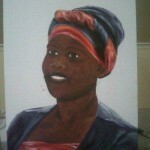 I put additional white next to the head when the painting was finished, to make it stand out more in contrast. Some friends said it was a bit “weird” for their taste, but I like it. At the moment I’m working on a second painting in the series. Keep checking the blog for updates. Please leave a comment. I’m looking forward to your feedback. My domestic has been working for me for 8 years. 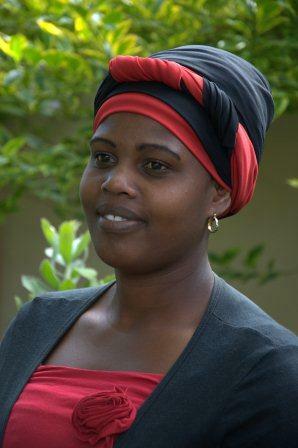 She is 30 years old, with 2 children and runs my household like a professional! Not only is Shela a pleasure to have around, with a great sense of humour and a work ethic that is second to none, she is also quite beautiful. She has been watching my foray into art during the last year with a lot of interest. About 2 months ago she was standing in the studio (read: a corner of the study that my husband allows me some space to paint) looking at my latest endeavour when she said: “Mammi, you must paint me a picture.” “What would you like me to paint for you, Shela?” I asked, thinking that she’ll ask for a nature scene or maybe a painting of the ocean. “Me!” she exclaimed with a bright smile. Well, I jumped at the opportunity to do a portrait. In fact, that was exactly what I had planned for my next project and Shela was the perfect model. We arranged for her to come through the next day, all dressed up for a photoshoot, and shot pictures of her in the garden, in the lounge on the couch, standing at the front door. She was brilliant! We finally chose a picture from the garden with her staring wistfully into the distance, face at ¾ angle to the camera. The light was great and I thought the picture made her look regal. I printed the photo on good quality paper and printed a black and white transparency as well. 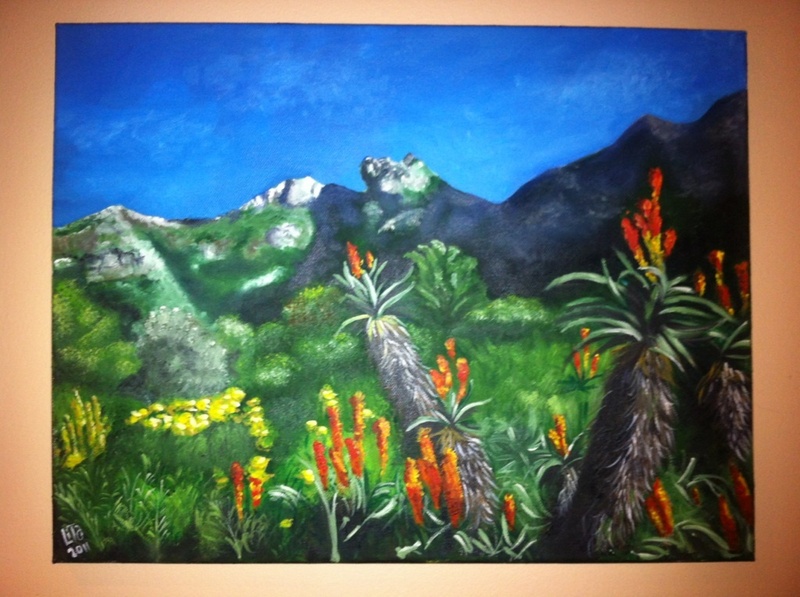 The canvas I used was 20 x 30 inches. I traced the picture onto the canvas with graphite using the transparency and overhead projector to ensure that the dimensions were correct. The next step was to get the first layer of paint on. 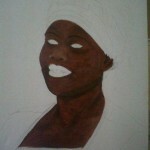 I used a combination of Van Dyke Brown and Burnt Sienna to cover most of the face. At first I tried the Zelco brand, but the Burnt Sienna was too “runny” – almost watery – and it didn’t cover well. My teacher suggested the “Louvre” brand, which worked a lot better. During this layer, I focused on getting the light patches and dark shadows in so that the form of the face could take shape. After this layer dried (which it did within in a week) I filled in the irises in Van Dyke Brown surrounded by a black ring in Lamp Black. 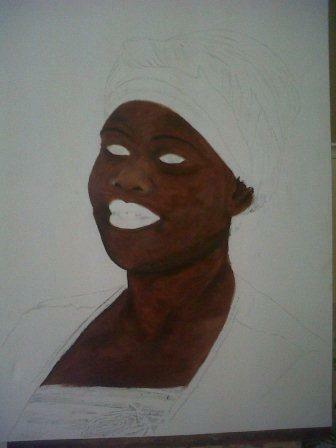 I also put another layer of Burnt Sienna and Van Dyke Brown onto the skin so that the canvas was covered well. Then I started on the clothes. 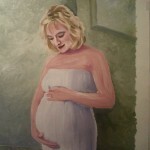 I wanted to have quite a contrast between the skin (having a smooth texture) and the clothes, which I did very roughly. I used the red and blue from the photo, but didn’t blend it in at all, trying to get a rough finish where the brushstrokes could still be seen. I used colours that didn’t necessarily show up in the photo, like orange, purple and green, to create interest. The shadows and highlights were quite pronounced. I was very happy with the outcome and it went quite quickly. When this dried, I started on the background. A green would make a nice contrast and let the face stand out more. 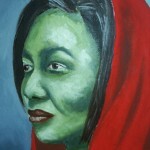 On second thought the green that I chose was a bit bright and started detracting from the portrait. Time to fix it later. Background added - still wet! The next step was to focus on the details of the face. 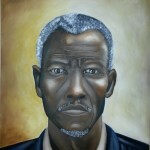 I ensured that the skin was blended smoothly and focused on getting the shape of the nose right. With the many layers I had painted over the nostrils and it was imperative to get them right. The details are what makes a person look unique – the way that we recognise someone. I used a combination of Burnt Sienna and Flesh together with Van Dyke Brown. I found that the eyes and irises were too large (if you’re unsure, take a picture and look at the picture on your phone or camera. It usually shows the mistakes easier). I painted the eyes smaller and ensured that the irises were the correct size. The white of the eyes were done with a light grey, and I put in the shadow created by the eye lid. The pronounced shadows on the eyelid, under the eyes and next to the mouth, were done in Lamp Black and blended with Burnt Sienna. The lips were quite dark with a glint of pink. I used Van Dyke Brown and Naphtol Red, Titanium White and Burnt Sienna to get the pink shade right. Sometimes I also used Flesh to lighten the tint. The lips had to be blended quite well with a couple of layers to get it just right. The teeth were done in light grey (never white!) and the gap between the front teeth is a tiny black line. The highlights on the teeth were done with white. 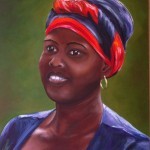 The highlights on the skin was also done with white, but blended very well into the rest of the tone. Where the white was too pronounced, I used Burnt Sienna to blend it in. The eyelashes and brows were done in Lamp Black, but when the brows looked too pronounced, I used Burnt Sienna to soften it. Also, be careful of not making the lashes too big or it will look unnatural. I painted a pupil in the eyes although it’s not visible in the photograph, but sometimes, for the sake of reality, you have to paint what’s not there. I also included Burnt Sienna in the irises to ensure that the eyes don’t look dead. Lastly, I added highlights to the eyes and that really brought them to life. 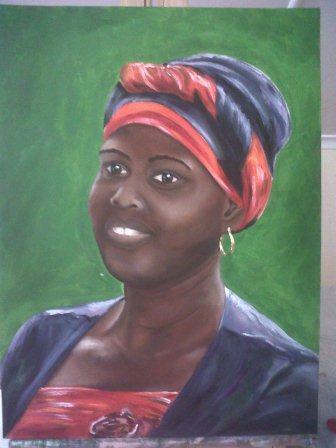 Highlights and shadows added, check the sparkle in the eyes! Finally the mouth had to be finished. 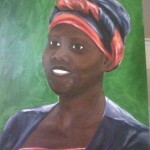 I took care to ensure that after the teeth were painted, the lines of the top- and bottom lips were painted over it. Otherwise it looks like the teeth are protruding from the mouth – not a pretty sight! The earring was done with Cadmium Yellow and grey with white to highlight the reflection. The background was re-done in a dirty green but still kept some of the light green from the first layer to give it depth and interest. 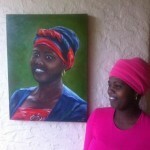 When I presented Shela with her portrait, she was stunned! Although I had shown her the progress (I was too excited to keep it to myself!) 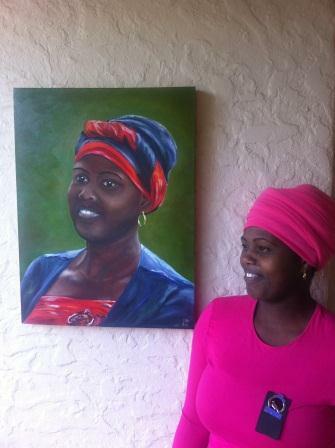 I don’t think she expected the finished portrait to be so beautiful. 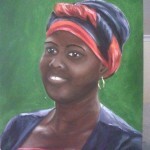 We will frame it with a simple wooden frame and she has assured me that it will have a place of honour in her house. I’ve always wanted to be an artist. I’ve often imagined hosting a fancy dinner and a guest pointing admiringly to a masterpiece on the wall asking who the artist is. I would then (modestly) confess that it’s me… This became a reality this year. I’ve never been able to draw. This is what I was told in primary school, when the apple I drew in art class more resembled a red baseball than a fruit. 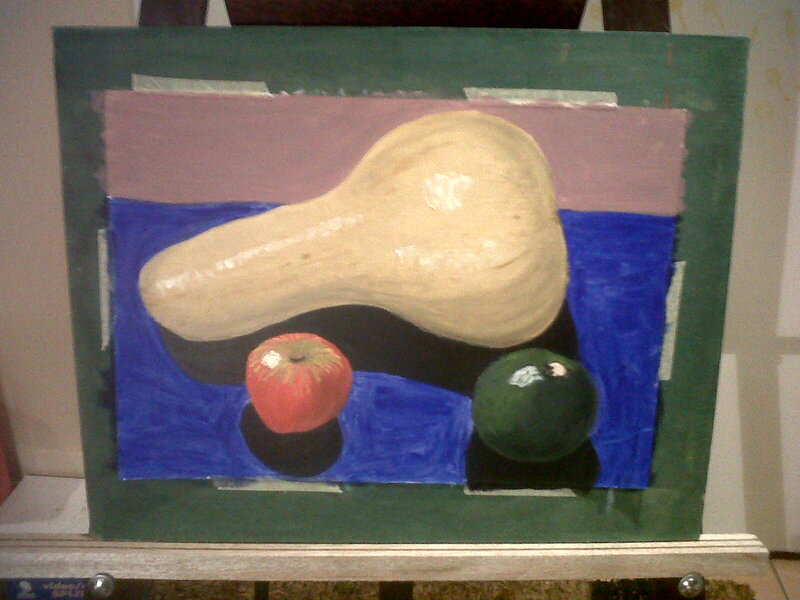 The art teacher patiently explained that an apple is not round and that was the first time that I realised that the appearance of things wasn’t actually what I thought it was. It took me another 34 years to muster up the courage to try my hand at another apple. At the end of last year I was stuck at home for the holidays with 2 boys under the age of 5. It was great spending some time with my kids, but towards the end I thought I was going out of my mind. I just needed something new and creative to allow me to feel human again. So, I borrowed my sister’s book “Drawing on the Right Side of the Brain” by Dr Bettie Edwards. I painstakingly did all the exercises in the book and was actually quite surprised at what I managed to achieve. Instead of thinking about how something should look and then trying to draw it (which is nigh impossible), I really looked at an object and drew what I saw. The outcome was rather amazing. 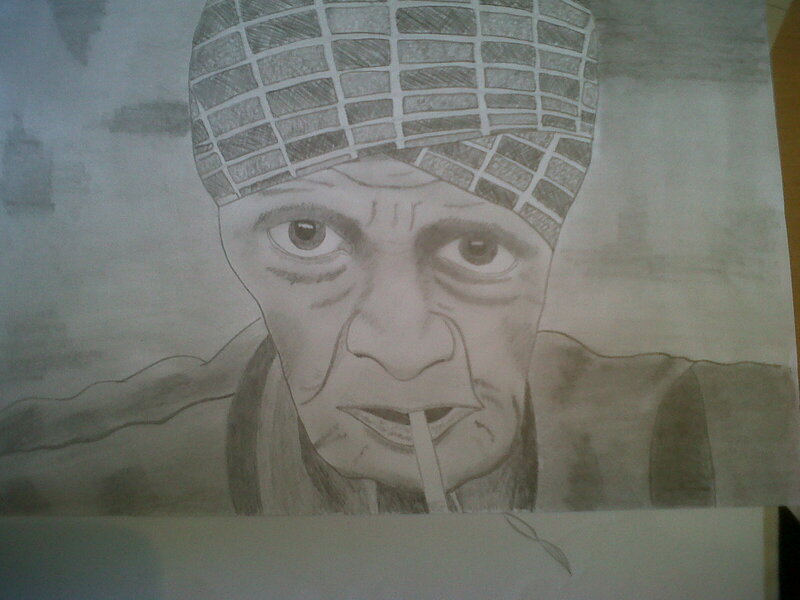 I drew the likeness of an old woman holding a cigarette in her mouth. Encouraged by early success I then set out to find an art teacher. I found a studio close to home that offered classes on Tuesday evenings, covering a variety of mediums. On the first evening the art teacher, Isa, set us up with charcoal and chalk and told us to choose a picture from a magazine and draw that. The result overwhelmed me so much that I seriously thought of framing it! I tried to learn what I could from both the teacher and the classmates and had a thoroughly good time. We learned how to draw without stylizing (that is drawing what you THINK it should look like instead of drawing what it ACTUALLY LOOKS like!) and although I still struggled every now and then, I found myself improving. 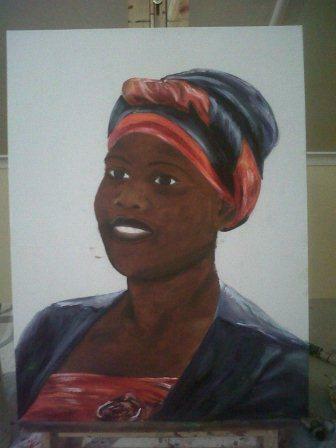 A couple of months later I created an oil painting over a photo printed on canvas. This I did frame and it’s hanging in my corridor. It’s one of my favourites. But I felt frustrated. 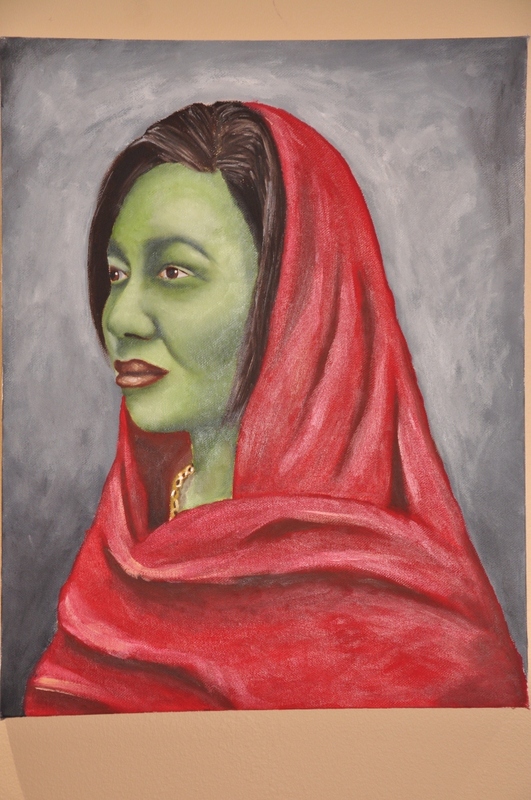 I wanted to work with oil paint and the classes were focused on exposing students to various mediums. I dropped out and bought a book called “Oil Painting for Dummies”. Sounds like it could teach me a couple of things, right? It did! It covered the basics around materials, mixing colours and creating a picture. Again I didn’t cut corners. I did all the exercises – still lives of vegetables, cans and bottles. I tried different techniques and brushes. 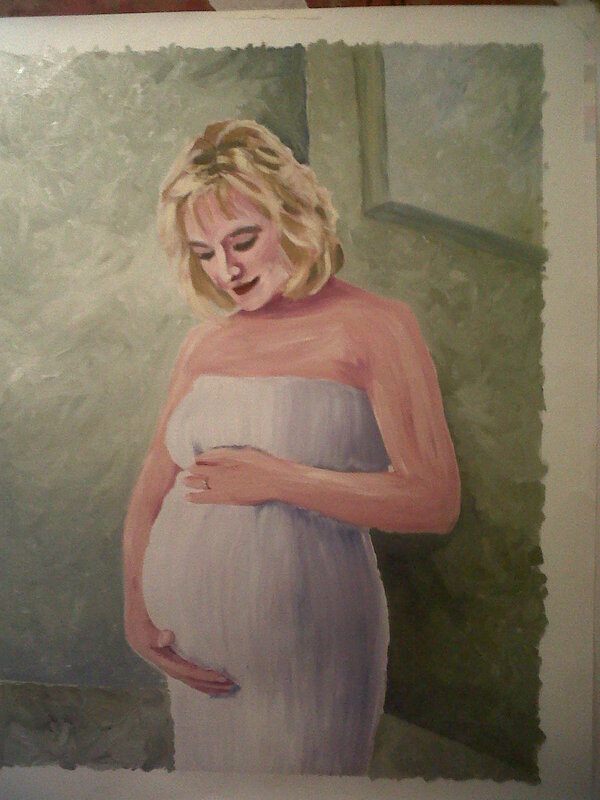 I painted from life and from photo’s. Some paintings came out better than others, but I learned something with every effort. Again, I found myself frustrated. After I worked through the book, I had even more questions. 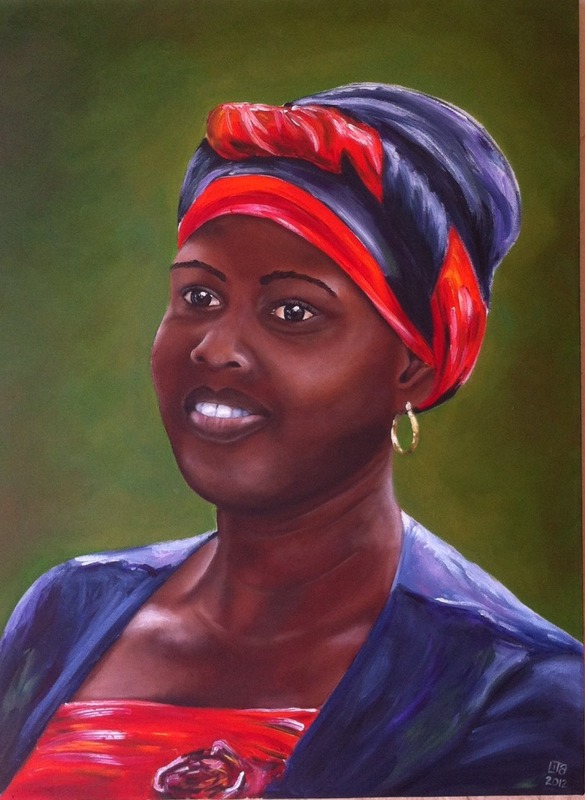 I set out to find another art teacher, one specialising in oil painting. 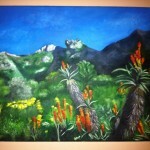 The one I found (Carien du Preez from www.paintitblack.co.za) specialises in creating realistic paintings in oils and acrylics. I started weekly classes with her. First I chose a landscape because I’ve always wanted to do landscape. It wasn’t my favourite picture in the world, but again I learned about painting in layers and using the contrasts in the painting to your advantage. The result was given as a Christmas present to my mother. She professes to love it! All throughout this, I would check out painting tutorials on YouTube, read articles on About.com about painting and practise, practise, practise! 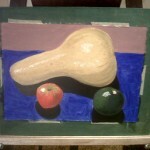 After the landscape scene, I wanted to do a still life. I found a beautiful photo and Carien and I started working. I did cheat a bit – I traced the picture onto the canvas from a projector to keep the perspective and the proportions correct. For me it’s the outcome that matters and not so much the journey there. Is that wrong? 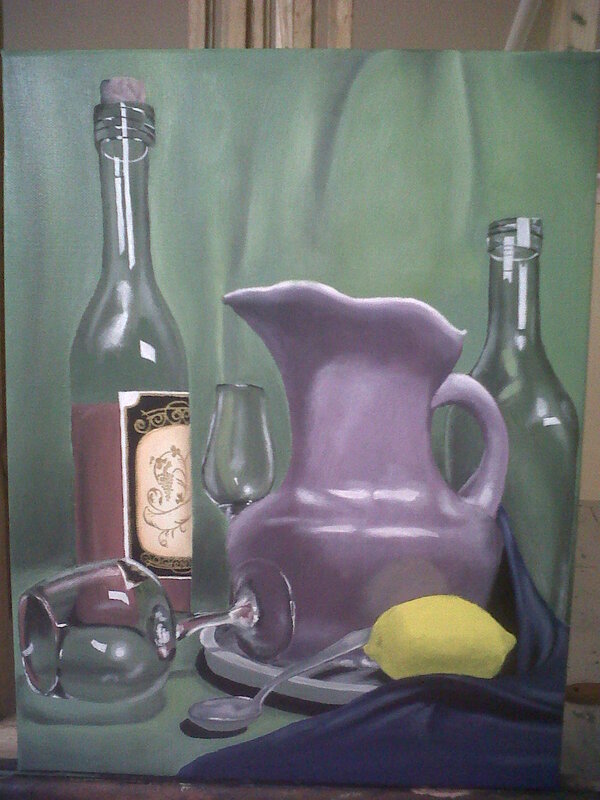 The still life came out beautifully! My best work yet. I was overjoyed that I managed to create something so awesome! It has been framed and hangs in my dining room, just waiting for that dinner guest to point out how beautiful it is. What have I learnt from the experience? Anyone can paint. If you can hold a pen with enough dexterity to sign your name, you can create a masterpiece. Sure, I won’t be the next Van Gogh or Picasso, but I don’t have to be. The satisfaction of creating something that is beautiful and can be admired is exhilarating. It does take time and effort, but if you are focused on the outcome and willing to put in the work, it will happen. 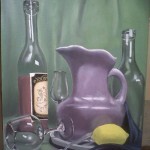 My next goal is to actually “sell” a painting! 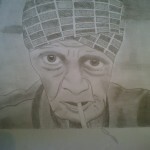 Keep on checking my blog for updated pictures of my art work.